1.) Buy yourself a durable water bottle. We don't need disposable plastic bottles. The water in the UK is safe enough to drink, and if you don't want it straight from the tap then there are a whole variety of methods you can use to filter it. 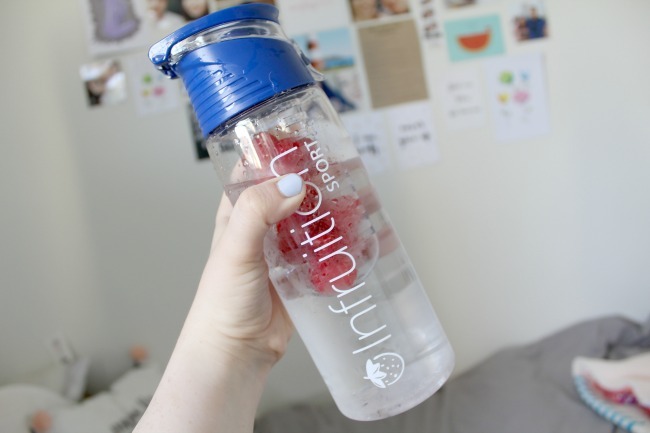 There are so many types of long-term bottle out there that you can use when you need water on the go, and my new fruit-infusable bottle (courtesy of the sis for my birthday) is my current favourite. 2.) Save up carrier bags. Yes, I have a cupboard full of carrier bags, because I'm one of those people that never throws them away. Full on carrier bag hoarder here. I bring them food shopping with me, I bring them when I head out shopping on the high street. If I end up with a massive excess of them, I also use them to line the waste bins in our house, instead of buying plastic waste bin liners. 3.) Re-use food bags. Again with the bag hoarding I know, but food bags don't have to be just a one-time thing as long as you wash them thoroughly. I like to meal prep lots of smoothie bags at the beginning of the week to freeze. Once I've used them, I simply wash them out with hot water, leave them to dry on the draining board, and put them back in to their drawer. 4.) Order recycle bins. Some houses I've moved into had no recycling bins *cue meltdown*, and others have simply not had enough. If you think you're lacking in room, and end up popping recycling into the waste bin as a result, then stop. Head on to your council's website and order some more bins: recycling bins are almost always free! 5.) Shop local. Buying local produce, or heading into butchers shops and greengrocers is something I love, and it usually works out to be cheaper than buying the same products from a supermarket. As well as having less packaging on the products themselves, local produce has had to travel far less, and is likely to have had less packaging to do so. 6.) Check out your council's recycling policies. Get clued up on exactly what they will and won't take from your home. You may find that you've been binning items they would accept. 7.) Re-use straws. This is a tiny one, I know. But a little goes a long way. I'm a big fan of a morning smoothie, and used to use a new plastic straw for it each day. Now I give the straw a rinse in hot soapy water and keep it ready for the next day. Obviously straws don't last forever, but they can last a good five or six goes at least. You can even buy glass or stainless steel straws which can be used time and time again to cut out the need for plastic altogether. 8.) Chew less gum. Yep guys, it's pretty much plastic, and it doesn't biodegrade very well at all. 9.) Use cotton tampons/pads. I've got a whole post on why these are much better for your body than generic ones, and they actually don't cost any more. Did you know that most pads contain chlorine, and you're getting that all up in your vaginal grill? Grim. Cotton biodegrades, so these don't end up sitting in the garbage dump for hundreds of years. 10.) Use solid soap and shampoo. Not only is it often easier to come across ones containing less nasties in this form, but you don't end up throwing away any plastic shampoo or hand wash bottles. LUSH does some amazing solid shampoos, and if you're wary about them, then have a read of my post in which I myth-bust stereotypes about solid shampoos. And there we have it! These are some truly simply steps that can help your household to cut down on plastic waste, without having to change your habits too much. Let me know what you'd add to the list! I love that you're thinking of 'going green' and using 'green' materials in things as seemingly small as straws. If only we were all so eco-conscious! I love that you're creating awareness! I really want to reduce mine, but my council (frustratingly) does not recycle animal waste, and that makes up so much of my household waste! I think it's so important to at least take charge of waste in your own home. So much more needs to be done worldwide, but if you can't start small where do you start?! Loved reading this post! I'm trying to become a more ethical consumer so posts like this are super helpful! Also it's a great excuse to buy a cute water bottle!